You can now book your appointment online on The Waiting Room and also order repeat medication. Note: You will need to have an account set up by the surgery on proof of identity. Open 8.30am – 12.30pm on Mondays, Tuesdays, Thursdays and Fridays. Appointments can be made at the reception desk or by telephone during the hours that the surgery is open. 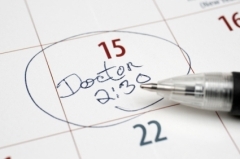 Some appointments can be pre-booked up to eight weeks in advance with the doctor of your choice. However, all other appointments will be not be available until the day you ring the surgery, but not necessarily with the doctor of your choice. You may choose to see any doctor in the practice, not necessarily the one whose name is on your medical card. However, it is probably better to try and see the same doctor during one episode of illness. Urgent cases will always be seen on the same day, although we cannot guarantee that you will see the doctor of your choice. Please do not ask for urgent appointments for non-urgent cases.